Nov. 4, 2016 7:00 a.m.
Letisha Reimer's friends say she was a vivacious girl with a contagious laugh and a generous spirit. But Letisha Reimer was a budding young woman who brought her vibrant smiles wherever she went and left them on the faces of those she met along the way. “She cared so much about other people. Always. Always thought of other people. Always giving hugs and smiles. Her smiles… Her smile is contagious,” a friend for whom Letisha babysat told The News. Letisha had the right personality for a babysitter. She was fun and caring and spoke to children many years her junior as if they were her equal. She was the only babysitter trusted with the two young brothers. “I trusted her to keep my children safe and the fact that she wasn’t safe just kills me,” the boys’ mom said. She was also a girl of her word. The same mom recounted how Letisha stuck to her word when she said she would do the Run for Water with her. She could have run with her school friends, but stayed at the side of her adult friend through the whole course, even slowing to a walk despite her long healthy legs, which could have taken her to the finish line much quicker. South Abbotsford Church, where Letisha worshipped, made a Facebook post about her on Wednesday afternoon. The post garnered an overwhelming response. Hundreds of people commented, expressing heartbreak, pain and grief over Letisha’s death. They promised to pray for her family and that of the other girl attacked on Tuesday. Josh Giesbrecht, who taught her as substitute teacher at Abbotsford Middle School last year, said Letisha was a favourite student. “It hurt like crazy to find out it was her who had died,” he wrote. 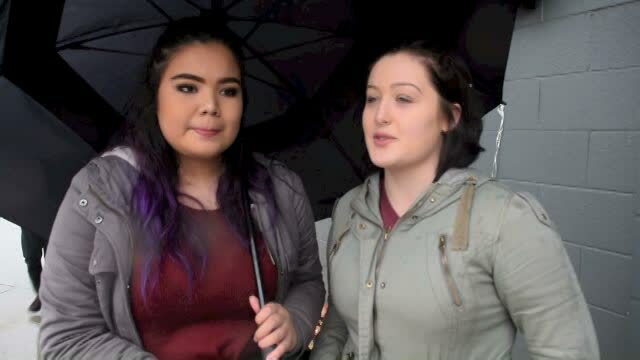 Members of South Abbotsford Church addressed reporters on Thursday evening, sharing memories of the girl they knew and loved. Letisha was a devoted Sunday school teacher and volunteer, they said. Stories of a bubbly and fun person were recounted. Just last weekend, only days before her death, Letisha was at a weekend retreat with more than 100 other young Christians. Kenzi Dirks, a youth leader, relayed a story she heard from another camp leader. Letisha was in her cabin when she was suddenly overcome with a burst of energy and started laughing and dancing around. Members of Letisha’s church spoke of her dedication to service, driven by a deeply held faith in her God. She was the first to put herself forward when on mission trips, including serving the homeless. South Abbotsford Church’s lead pastor Matt Ewert said he was looking through pictures of a recent volunteer activity where members of the church did yard work for community members. He was unable to find a clear picture of Letisha, however, because while other youth would look up, smile and pose for a shot, she had her head down, engrossed in the task at hand. Letisha had been studying in a common area of Abbotsford Senior Secondary with her close friend on Tuesday afternoon when the random violence descended. They were both attacked without any known reason. While her friend – who cannot be named due to a court-ordered publication ban – appears to be recovering in stable condition, Letisha succumbed to her injuries. She was only a few weeks into being a high school student and was taken from her loving family, her school, church, friends, and community. She had not spoken much about her plans for the future to the mom she babysat for. She’s described as living in the moment, taking joy where she found it and radiating it back into the world. Her friend was looking forward to seeing Letisha become a young woman in the coming years.